A general view of Mayo flags. THE GROUP OF players who have departed the Mayo ladies senior football panel have released a statement through the Women’s Gaelic Players Association (WGPA). News broke this morning that a group of ten players had left the set-up ahead of their TG4 All-Ireland senior championship opener against Cavan on Saturday. Among the players who have withdrawn from the squad are team captain Sarah Tierney, who plays her club football with Hollymount, and experienced Carnacon duo Cora Staunton and Fiona McHale. 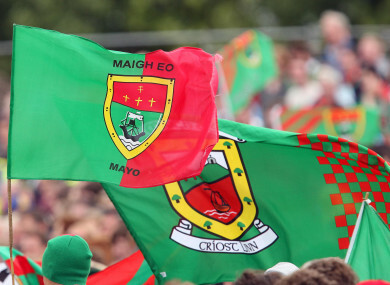 “We have stepped away from the Mayo panel for player welfare issues that are personal and sensitive to the players involved,” the statement read. “The WGPA wishes to acknowledge the situation in Mayo Ladies Football at present. We are aware of the issues at hand and are supporting all of the players. “We recognise the physical and emotional commitment required to operate at the top level of our games and respect the decision of all individual players regarding their own personal playing experience. Email “Departed players and WGPA release statements following Mayo walkout”. Feedback on “Departed players and WGPA release statements following Mayo walkout”.